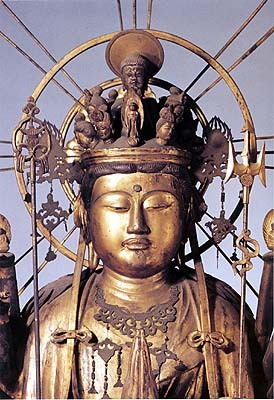 The smaller Kannon are all life-size, being around 5' 6" tall. They were created by Tankei and a team of seventy sculptors working under his direction. This Kannon, #40, was carved by Tankei himself. In 2000, the statue - a National Treasure - was moved to the Tokyo National Museum for display.